On my desk is a copy of Times and Tendencies, Boston and New York, 1931, a volume of essays by Agnes Repplier (1855-1950). It was formerly owned by the bibliophile Gabriel Austin. 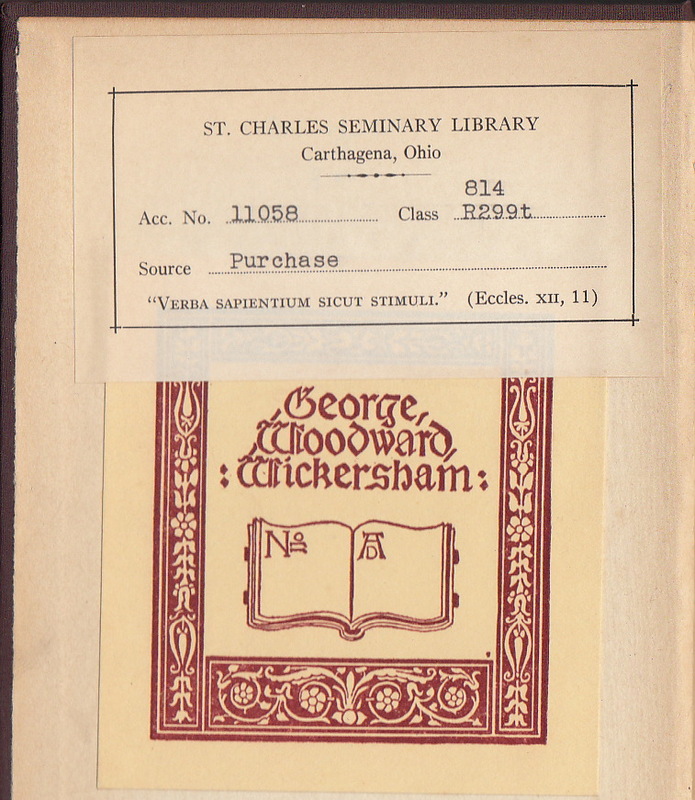 At one time, it was formerly owned by George Woodward Wickersham, President Taft's Attorney General, and the book contains Wickersham's bookplate. 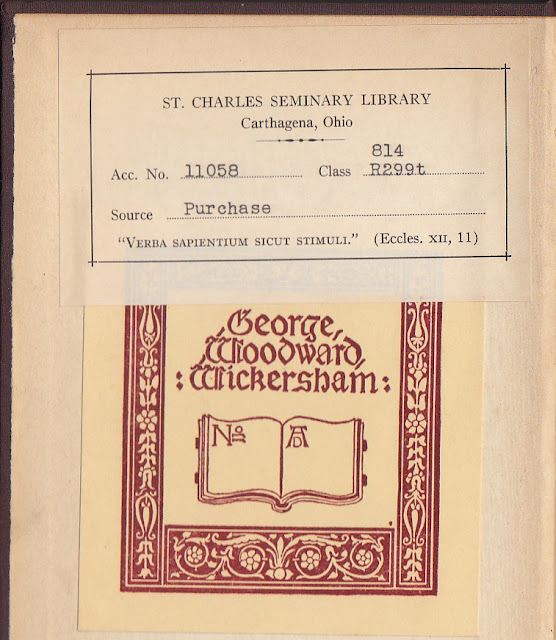 Pasted over the top of his bookplate is the bookplate of St. Charles Seminary, Carthegena, Ohio, which contains part of a verse from Eccles. XIII, 11: "Verba Sapientium Sicut Stimuli," meaning "The words of the wise are like goads." "...the pleasure of possession, whether we possess trinkets, or offspring ––or possibly books, or prints, or chessmen, or postage stamps –– lies in showing these things to friends who are experiencing no immediate urge to look at them." And now I have the pleasure of displaying some of the many periodicals in my possession. I hope you enjoy viewing them. 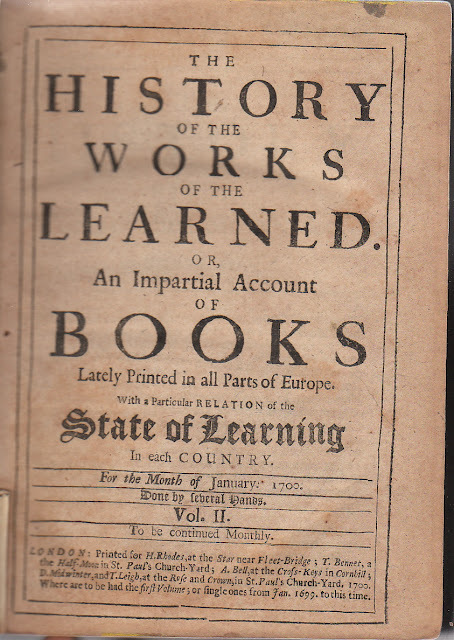 The review of the first book caught my attention –– mind you, this was published in 1700. 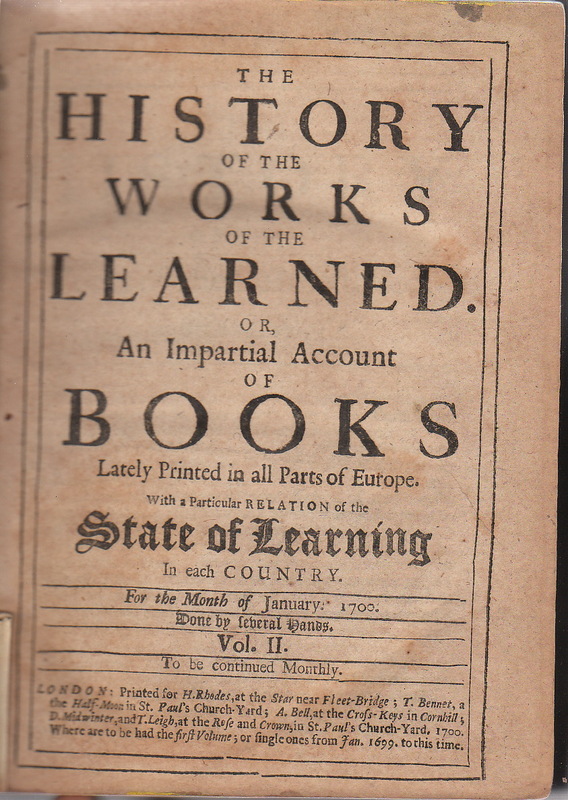 The title was Experiments of Wind: Hypotheses of the Earth's Motion: The Phenomena of the Trade-Winds, Tides, Currents, Solv'd: A Perpetual Motion Intimated: Observations of the Weather, Winds, Loadflow, Magnetic Variations, and a Water-Screw by Edward Harrison, Gent. 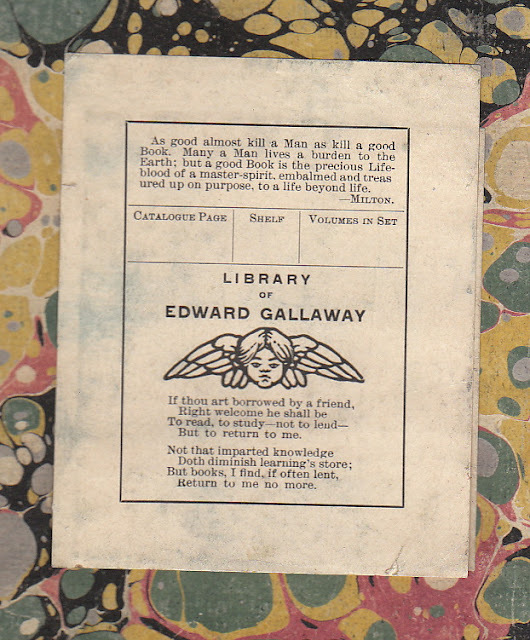 Edward Gallaway was a typographer who wrote several books on printing in the early 1900s. A copy of Erdnase, The Expert at the Card Table, containing Gallaway's bookplate was in the Magic Collection of Jay Marshall. The complete title is The Librarian, Being an Account of Scarce, Valuable, and Useful English Books, Manuscript Libraries, Public Records, &c.&c. Savage published this work monthly from July 1808 to January 1810. He included a list of books published for the month, but what he reviewed were the contents of the British Museum and other libraries in England. Now I'm not much for recommending e-books, but I've already downloaded James Savage's book, Memorabilia, or, Recollections, Historical, Biographical, and Antiquarian, first published in 1820,, and which contains "Dr. Johnson's Conversation with the Late King." Here's a shelf of periodicals from bibliographical societies and from monthly and quarterly reviews. 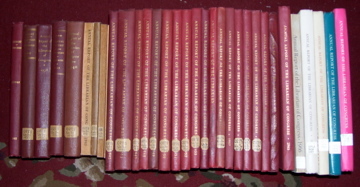 I have the complete run in two volumes from December 1861 to December 1863. I also have an extra copy of Vol II. The complete title is The Philobiblion: a Monthly Bibliographical Journal Containing Critical Notes of, and Extracts from Rare, Curious and Valuable Old Books. 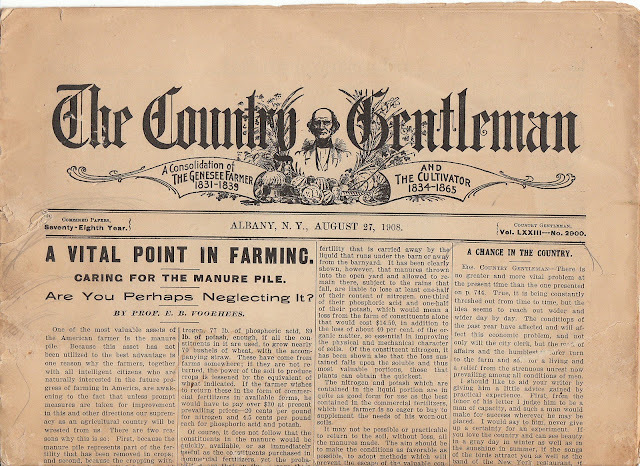 I suspect that the Civil War affected the periodical's circulation; but I alƒo wonder if the publiƒher's uƒe of the long S had ƒomething to do with it'ƒ demiƒe. Paul Leicester Ford was the editor of the above short-lived periodical; he was murdered by his brother. 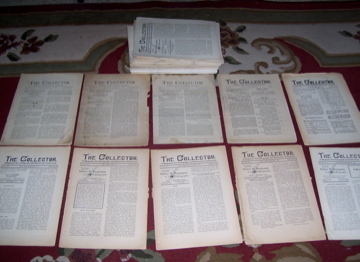 Here's 60 issues of The Collector: A Monthly Journal Devoted to Autographs, the subtitle later changed to A Magazine for Autograph and Historical Collectors. Here's a periodical containing the Annual Report of the Librarian of Congress. Notice the difference in bindings? 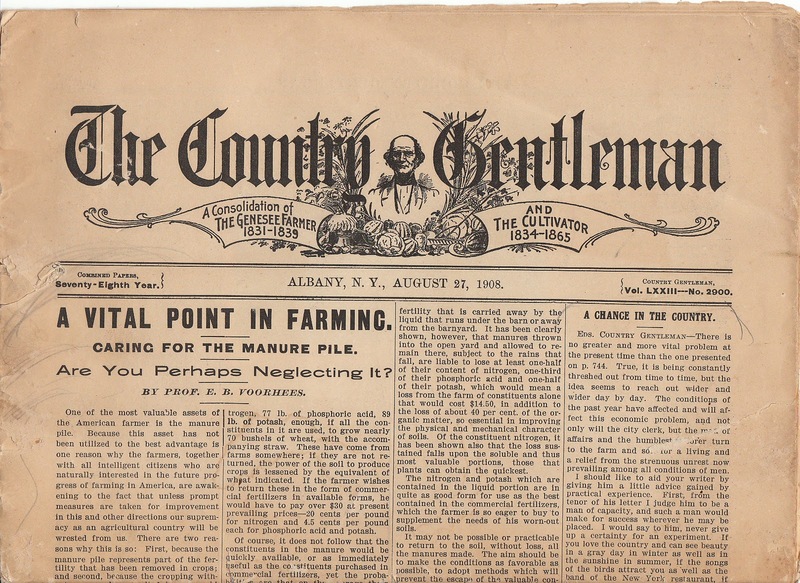 How high is your manure pile? Now why would I have an issue of this periodical? Three of my four children were born on this base in Illinois, now called Scott Air Force Base. 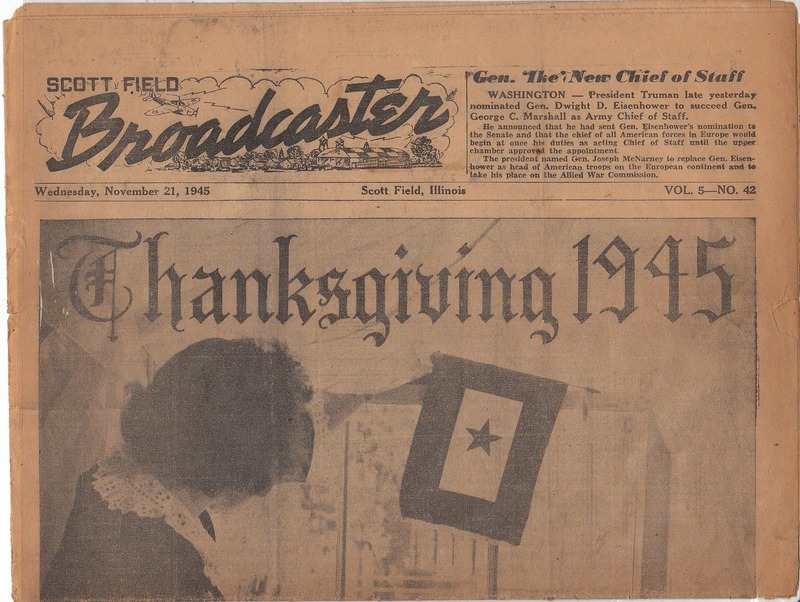 When I first started collecting periodicals, I wanted to collect only early issues of periodicals. I soon realized there were just too many periodicals in the world for me. Here are more of them. I also have books about periodicals in my periodical collection. You can view them and all my periodicals on Library Thing. Erdnase was a part of a pseudonym "S.W. Erdnase" for the author of one of the most important (and collectible) books on card handling and cheating at cards. The Wikipedia entry on Erdnase summarizes some of the theories on who Erdnase was.